I love a G&T, so much so that I have an entire garden named after my favourite drink. Naturally I was very happy to discover another garden inspired by the juniper-infused spirit at this year’s Chelsea Flower Show. The Silent Pool Gin Garden was part of a line up in the new Space to Grow category. If I’m honest I didn’t really grasp the distinction, except that each of the gardens had a smallish scale and a contemporary twist. Space to Grow included gardens highlighting the threat to our underwater ecosystems, the experience of young people with HIV, skin care and awareness of Myeloma, alongside gardens promoting gin and a non-alcoholic ‘spirit’ called Seedlip, featuring plants exclusively from the pea family. Let’s just say it was a broad church. The best thing about Space to Grow was that the RHS had pushed these gardens back against the show’s inner perimeter, providing them with the backdrop of Christopher Wren’s magnificent Royal Hospital, a nugget of borrowed landscape that money could not buy. There’s no comparison with the Great Pavilion on the other side of Royal Hospital Way, a functional building with about as much charm as a Zanussi washing machine. 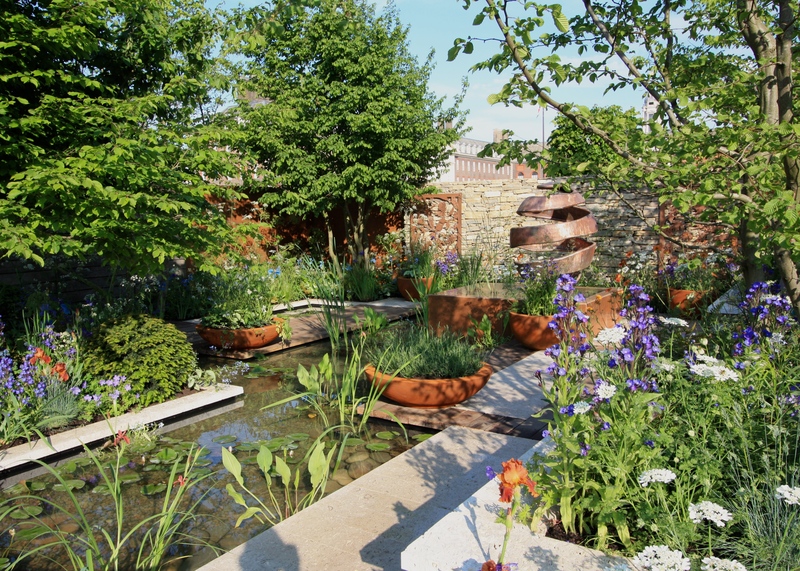 Designed by David Neale, the Silent Pool Gin Garden effectively addressed two briefs – to create a relaxing, urban haven in which a professional couple might unwind, and to incorporate references to distilling and the Silent Pool brand in particular. This ‘professional urban couple’ is particularly well served by garden designers at RHS shows, although I have yet to meet anyone resembling them: these lucky people have a lot more money than any professionals I know. Nevertheless this was a garden that professional people, twinned or otherwise, might aspire to, provided they could afford a skilled gardener to maintain it whilst they go about their busy lives. Where the designer’s skill lay was in interpreting the sponsor’s exquisitely romanticised brand. Back in 2014, Silent Pool gin was in the vanguard of a new wave of British gins, which has lately built into something of a tsunami. Silent Pool is distilled and bottled in Surrey, using water drawn from an ancient spring that rises from a natural chalk aquifer. The gin’s name is taken from the ancient freshwater pool which the spring feeds. The pool, considered by some to be sacred, is noted for an eerie and unexplained calmness. The water exhibits n intense, blue opalescence, caused by the chalk content. 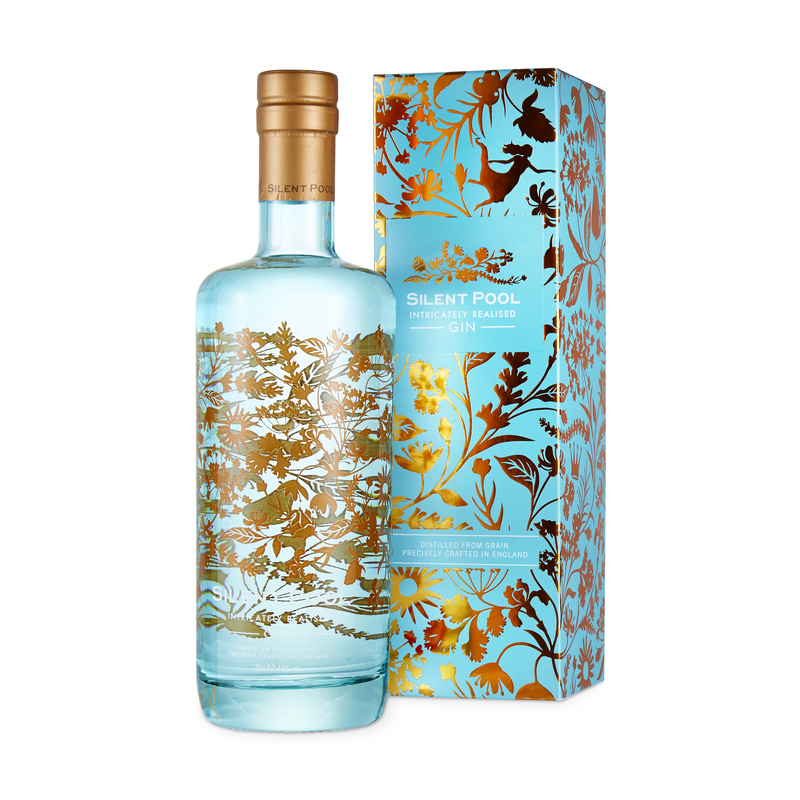 The bottle mirrors exactly the colour of the pool’s water at its deepest point: it’s a pale, translucent, teal-blue vessel, adorned with a filigree pattern depicting the 24 botanicals that form the gin’s unique recipe. The silhouettes of rose, iris (orris root), lavender, camomile, angelica and nineteen other botanicals are picked out in copper, echoing the bespoke stills in which distillation takes place. Look closely and you will find illustrations of the evil Prince John and Emma, a woodcutter’s daughter, whom the prince is said to have drowned in the pool. How we adore a product with a good story attached to it! So here we have the garden’s essential ingredients – still water, overhanging trees, decorative botanicals, filigree panels, cool blues and coppery oranges. (Alas no trembling maidens or wicked knights, but perhaps they are being held in reserve for next year’s show?) These are attractive elements to work with, at once restful and also sufficiently diverse to create tension and interest. David Neale chose UK-sourced Purbeck walling, warm Portland stone, rugged Corten steel and weathered English oak as his hard landscaping materials, using them to create a series of walls, raised beds, pathways and planters framing a sequence of pools and planted areas. 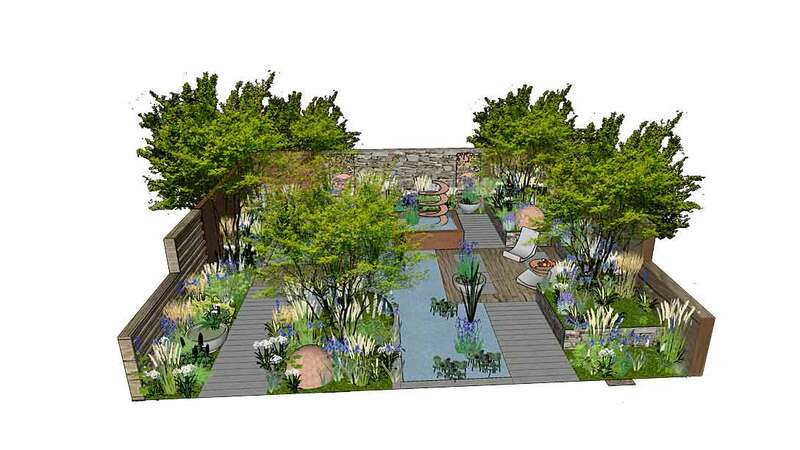 A restricted palette, with only multi-stemmed hornbeam used as structural planting, made for a calm and clean garden. 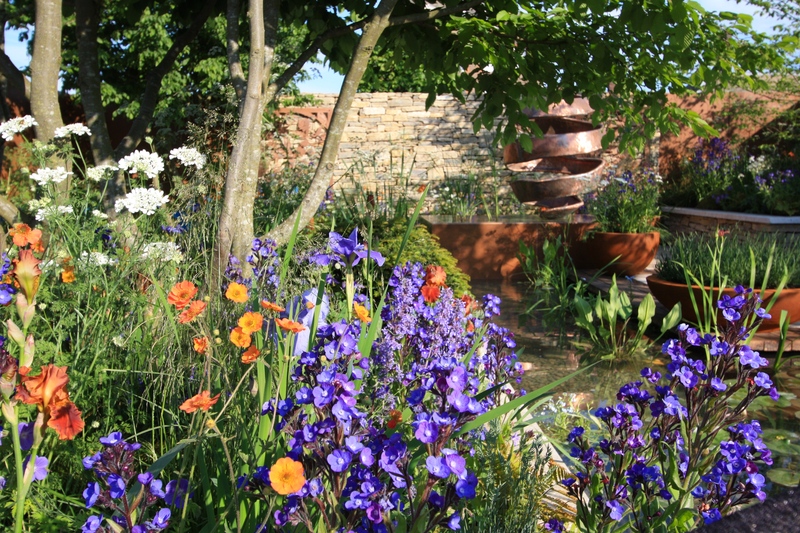 Drama was delivered in the form of a twisted ‘citrus peel’ sculpture, formed of hammered copper, and a gorgeous planting scheme. Here we got to enjoy Chelsea stalwarts Anchusa azurea ‘Dropmore’ and Geum ‘Totally Tangerine’ combined with Dryopteris erythrosora ‘Brilliance’, Corydalis flexuosa ‘China Blue’, Aquilegia ‘Henson Harebell’ and Calamagrostis ‘Karl Foerster’. Somewhere in the undergrowth were the blue poppy, meconopsis, with flowers of the most perfect Silent Pool blue. In the water grew Iris fulva, the Amercian copper iris. Presented in perfect condition, David explained that the flowers had been encouraged into bloom in a child’s paddling pool in his parents’ conservatory. 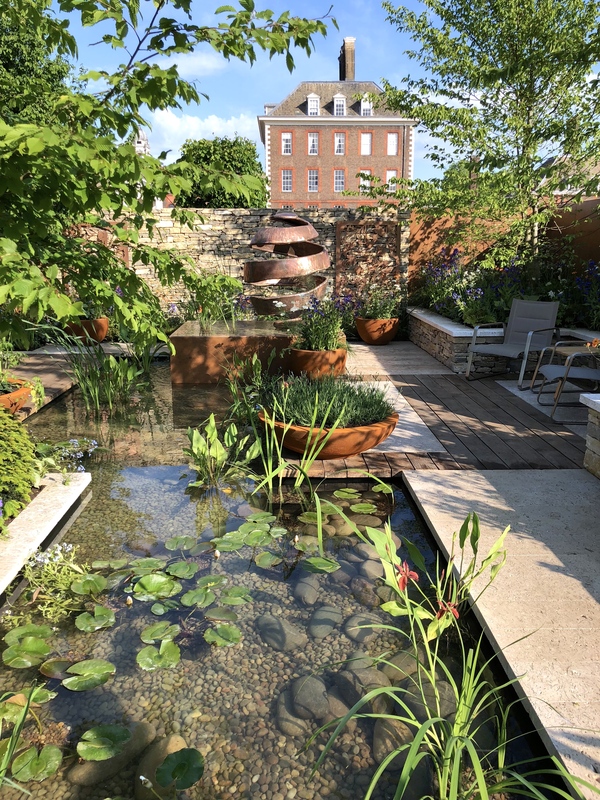 Chelsea designers will go to any lengths to achieve perfection and this garden came so close, landing a fashionable silver-gilt medal and, perhaps more importantly, the People’s Choice award in the Space to Grow category. 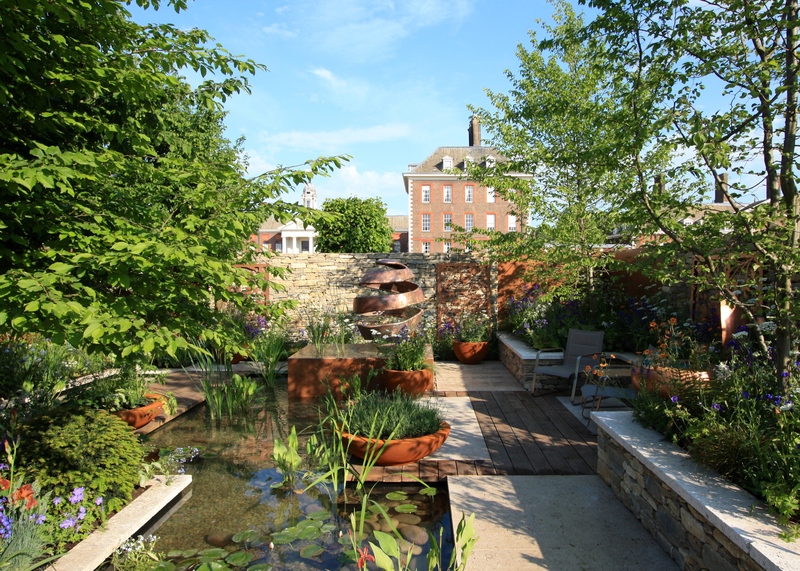 There was nothing challenging, quirky or especially original about this garden – we have seen the like before – but thank goodness it was in the Chelsea mix. Most of the gardens at this year’s show were great to look at, but not to live with. My earlier gentle sarcasm aside, this garden would have satisfied the aspirations of professional clients dreaming of a garden in which to unwind on a summer’s evening. Here they might readily enjoy a gin and tonic, gaze into the water and quietly slip into a fantasy world where princes really do drown maidens in silent pools. TFG. What an utterly charming urban garden. I love it, especially the design elements based on ancient concepts from the Romans and the Persians before them. If you find me sitting there, just bring me a glass of Riesling with a couple of blueberries in the bottom. That garden can be enjoyed while sober as well. It really is exquisite, but I do think it will be nicer when we start hearing about each other’s gardens again. Point taken Tony. It was a bit of an experiment to see how much interest there would be in me covering a few more gardens this year. As for my own garden, it has been shrouded in thick sea mist for three days (very unusual) and then coated in brick dust courtesy of my carpenter, who is cutting me a side door into my workshop. It will be brilliant when it’s done so I am gritting my teeth whilst he gets on with it. Have a brilliant weekend. I am sure there is interest. One of the main complaints about my garden column is that I do not write about other gardens enough. (We do not have such gardens here, and the few we do have are not nearly as impressive.) However, I am one who is not so interested in the fabulous gardens nearly as much as home gardens. I do not have a staff to take care of my home garden, and would not want anyone messing with it anyway! I still prefer to believe that some of my readers like to read about what they can do themselves in their home gardens. Perhaps that is why my column is in only a few newspapers. This looks like a perfect place to enjoy a G&T. I love that packaging and the colour palette for this garden. I made a gin-and-tonic cake for a party the other week. It’s the new lemon drizzle. Yummy. I know how popular lemon drizzle is, so I bet your cake disappeared in minutes. My mouth is watering just thinking about it! I was happy to read many posts from Chelsea. Thank you! Imagine a gin-filled pool. Heaven. One could float lemon slices on the surface in place of waterlilies! I love Silent Pool gin – and the garden looks wonderful. Couldn’t be bothered with much of Chelsea this year, but I am glad this one got good coverage. I can recommend their rose gin too, it’s pretty much my favourite tipple. Oooo, I must seek the rose gin out. I have quite a few bottles to get through before I buy any more though! Have a cracking weekend. I adore this post and the story behind both the gin and the garden. He used the inspiration brilliantly and this was high on the list of favorites of mine this year, particularly because of its sense of style and vaguely (with generous donations) attainable and livable nature. I would GLADLY unwind and sip G&Ts in this garden! Oh dear. I’m afraid fog is a bit of a curse on North Cornish Coast. Down in St Agnes my sister seems to be shrouded in it for half the year! Damselflies are something I miss about having a pond. I am hoping I can somehow incorporate one into the G&T garden, but it has to be in the right way otherwise it will look silly. It is very cool and refined. I would love to be as cool and refined. Sadly, the pool would be full of floating scum and the decking/ paving algae infested. It would need a few gin and tonics to get over the disappointment. Enjoyed all your coverage on Chelsea – great presentation as always. I like the ‘Gin’ garden with its lovely water feature. This was one of my favourites at Chelsea. A first time visit for my son and me and I have to admit that I got a bit weary of the gardens which told a worthy tale but which made us spend too long trying to decipher the message. This was a pure delight which we both seized upon as being somewhere we’d love to sit for a while. 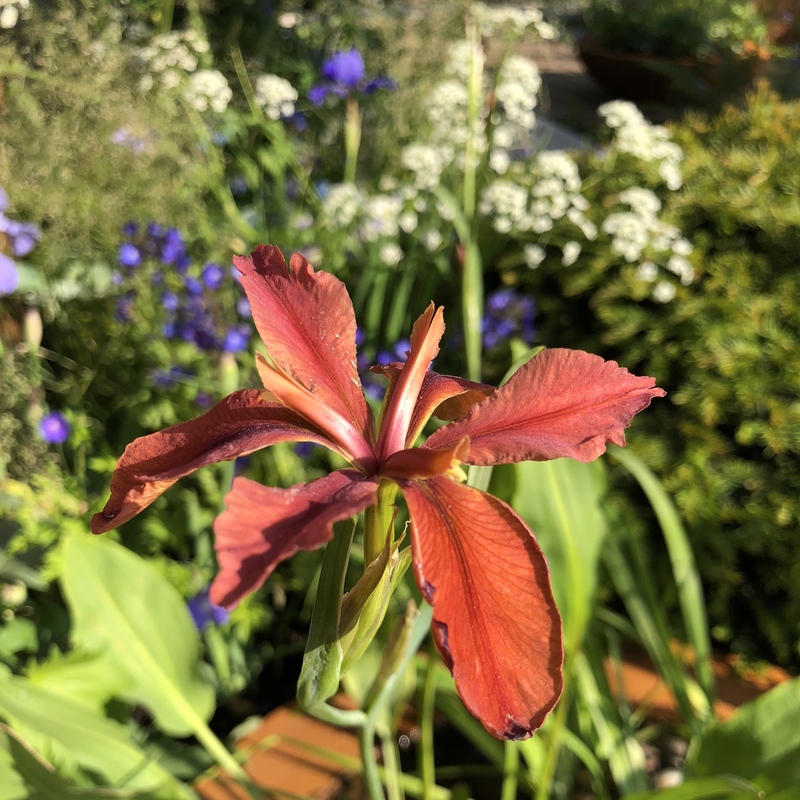 Plus we had just been vocal in expressing our lack of appreciation of another garden only to discover that we were standing right by the designer so being able to be fulsome and honest in our praise – should anyone be listening – was a joy. Oh dear! That does happen!! I had to learn to moderate my tone whilst judging as I was never sure who might be listening in. I’m glad you enjoyed this garden and I was not surprised it earned the popular vote. I can’t agree more with your thoughts about the ‘gardens with meaning’. Perhaps they should be given their own category and then we can avoid them, or be issued with an audio guide! Some are just too weighed down by purpose and forget to be lovely. Oh yes, I’ll definitely go again. I had feared it would be like Waitrose on Saturday afternoon but, though packed with people, everyone was very good natured and so we had an absolutely lovely time. 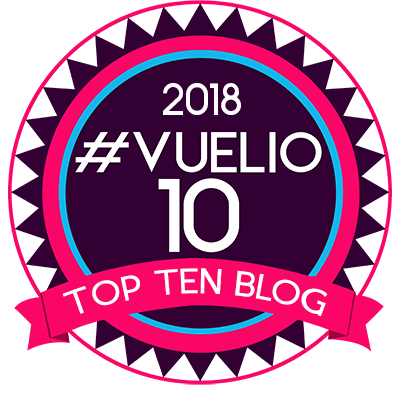 I think that any creative endeavour – garden, art work, musical composition, dance performance – which tries to convey a message is batting on a very sticky wicket. Give us a pamphlet or give us a garden would be my preferred approach. Kudos to the designers for trying though. No doubt it’s terrible infra dig but I dig like the Sipsmith garden comprised entirely of members of the pea family. After the worthiness it struck me as joyfully silly in just the right way.